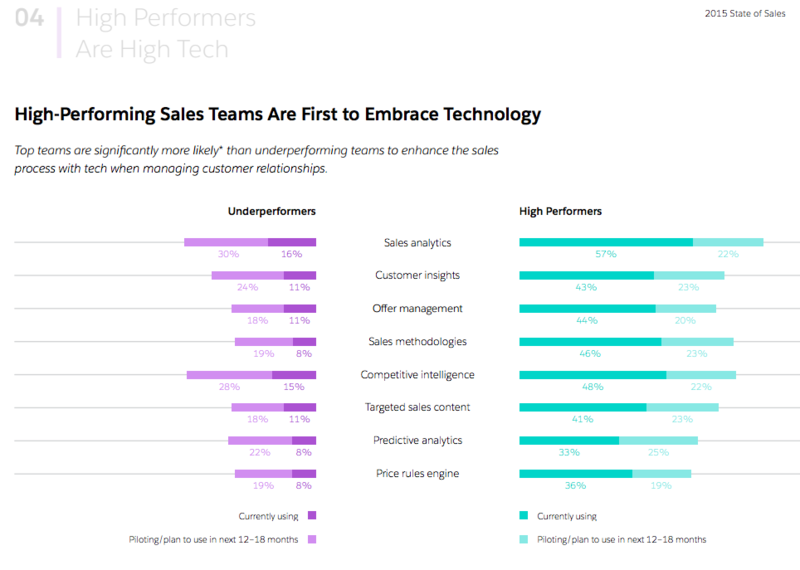 Salesforce recently put out their State of Sales report, which surveyed more than 2,300 global sales leaders to learn about their goals, how high-performing teams are staying ahead of the curve, and what the hot priorities are over the coming 12-18 months. 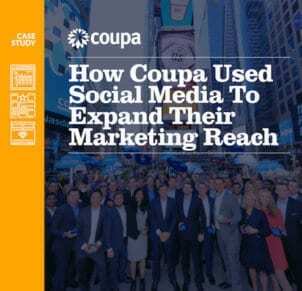 It’s a great report with a lot of detail; recommended reading for anyone managing a sales team. 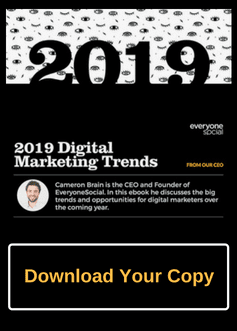 As we recently did with our 12 Global Trends Every Marketer Needs To Know Now post, we wanted to highlight the primary takeaways. Newsflash: sales organizations are in a state of upheaval. 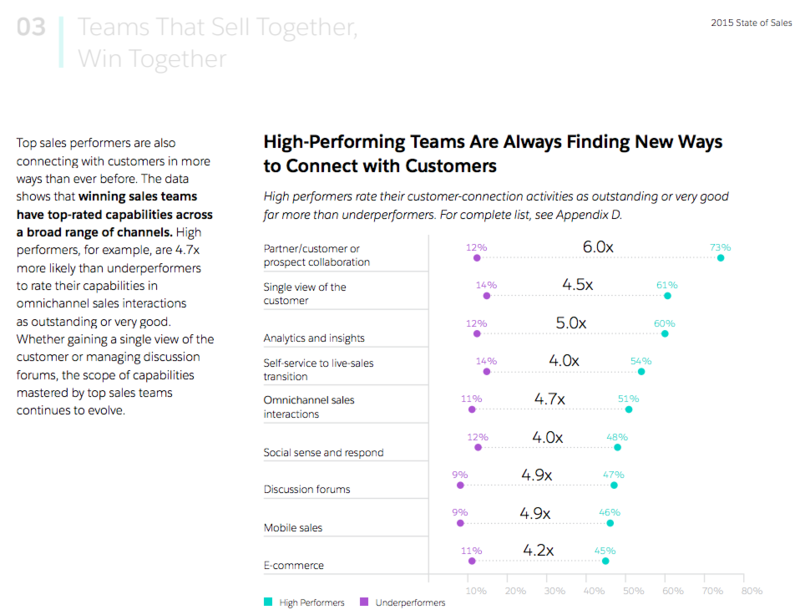 As called out in Salesforce’s report, there’s a big spread (as in a three-five times spread) between high and underperforming teams. Yes, market conditions and buyer habits are continuing to change, but as we’ll go through in this post many of the remedies are surprisingly clear. At the top level it comes down to having a more agile sales organization that embraces data and new technologies. Let’s dive in! 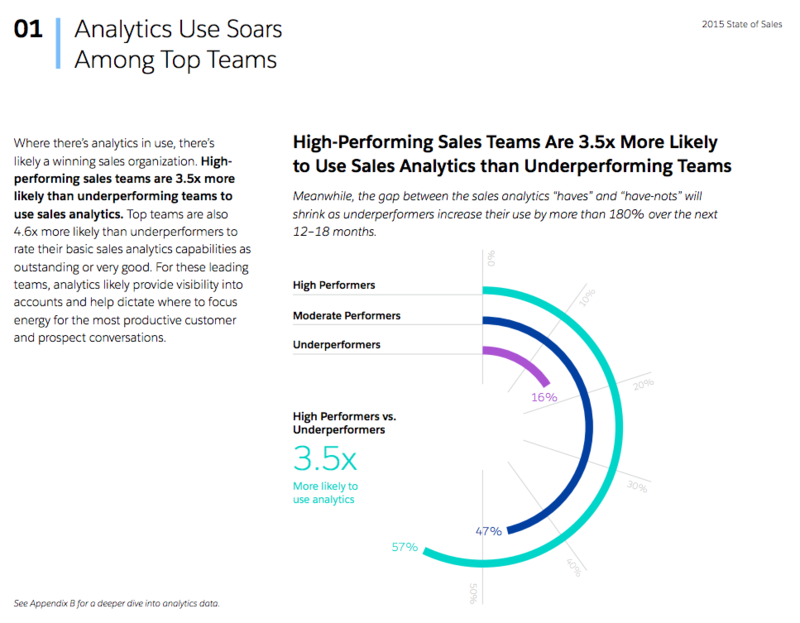 High-performing sales teams are 3.5 times more likely than underperforming teams to use sales analytics, while top teams are 4.6 more likely. What are sales analytics? Salesforce defines them as basic data, insights across the entire customer lifecycle, customized dashboards using defined KPIs, predictive data, and prospect/customer feedback. 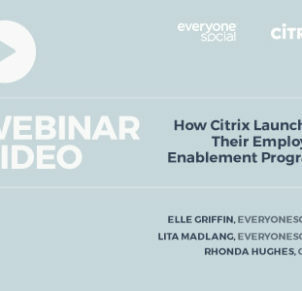 Like most sales-enablement technologies, we’re talking about the difference between doing something vs. doing nothing. Analytics are probably the most blatant example: the degree to which your people are actually looking at data, the more they’ll know and the more effective they’ll be. While there’s currently a large spread between top and underperformers, Salesforce cites that many companies are currently piloting analytics solutions and expect the gap to be much smaller in the next 12-18 months. It’s easy to become desensitized to the importance of “Data! Data! Data!” but even a little bit can go a long way and it doesn’t need to be complicated. 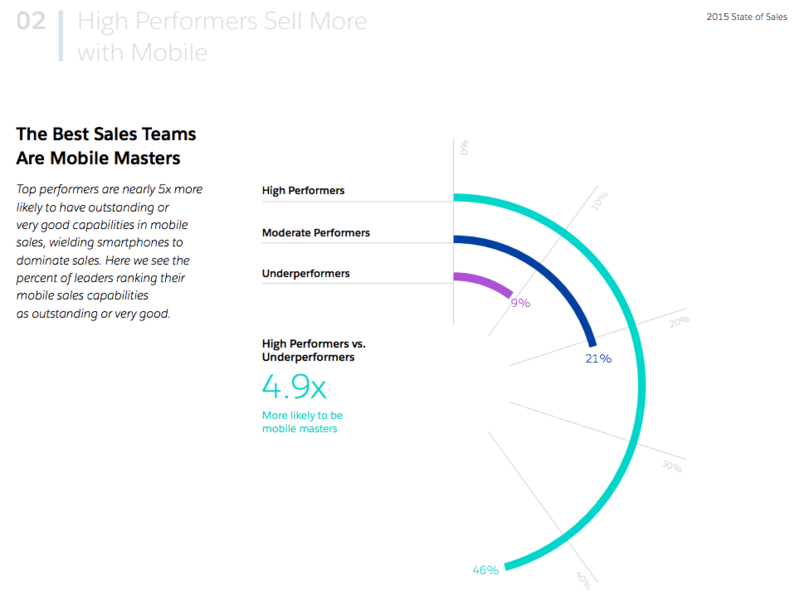 High performers are two times as likely as underperformers to use or have plans to use a mobile sales app. Among all sales leaders surveyed, use of mobile apps for salespeople will more than double in the next two years. High performers are also five times more likely to have outstanding or very good capabilities with mobile. The increasingly prominent role of mobile makes sense and like the other qualities of high-performing sales teams is an example/proxy for overall digital proficiency. In the year 2016 there are many things that can only/primarily be done on mobile: call, text, message, engage on social platforms, etc. If you’re team isn’t on mobile and/or isn’t equipped or capable of using it effectively, they’re not going to be top performers. It’s that simple. 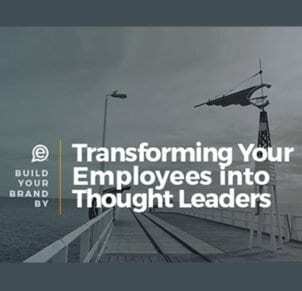 Organizations that are rising to the top are those that have mastered a holistic customer approach – they know that today’s sophisticated buyer has an equally complex and unique relationship with your business that encompasses sales, marketing, and service. High performers are nearly three times more likely than underperformers to view sales a 100% the responsibility of the entire organization. In this day and age, virtually everyone in any given organization has something to contribute to the sales process. At a basic level, consider these two facts: 1) everyone in your company is individually connected with 1000+ people outside your company and 2) the overlap (connections in common) is less than 10%. Leveraging those relationships to win, retain, and grow clients is a high priority of top performing teams. With the exception of certain vendors (*cough* Salesforce *cough*), new technology is typically neither expensive or difficult to deploy. 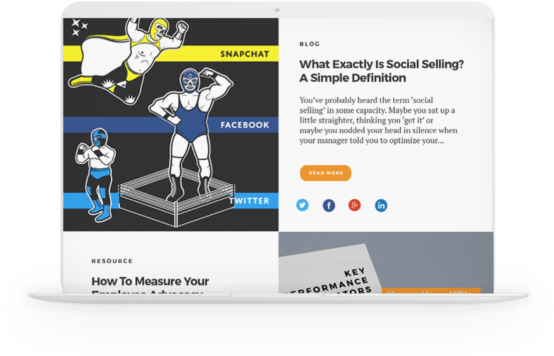 Everything cited in this post and Salesforce’s report can be had on a mobile device, which everyone at your company already possesses. 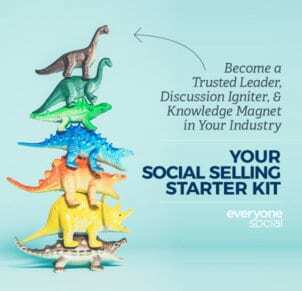 There are numerous options to satisfy each of the five priorities listed above (EveryoneSocial is currently used by many B2B and B2C companies for 2, 3, 4, and 5), all of which can be tested at a small scale – i.e., no need for months of planning or big amounts of spend to begin seeing real results. To be a high – or top – performing team, you need to be agile. Agility in a sales context means enabling each individual to have the info and tools they need at their fingertips, to operate in a cross-functional manner (kill those silos! ), to make data (and understanding how to interpret it) a priority, and to not be afraid to try new technologies. Move quickly, try things out, ditch what doesn’t work, keep what does, and repeat.